This is ideal for those of us who love to go picking blackberries, and of course, they are available in the shops. Some people dislike the seeds, but this recipe gives us the delicious full flavour without the seeds. It also has the prettiest colour. You will need a 20cm (8in) loose base shallow tin or a flan dish, also a large piping bag and a star tube. A sieve is needed, a nylon one is preferable. If using a tin, cut a strip of parchment paper to line the sides. Base: Crush the biscuits finely, add the sugar. Melt the butter and mix well into the biscuits. Press firmly into the base of the tin or dish and put it in the refrigerator. Blackberries: reserve 9 for decoration and put the remainder into a pan with 25g (1oz) of the sugar but no water. Simmer gently for a few minutes until just soft. Strain off the liquid and reserve it. Rub the blackberries through a sieve to remove the seeds. Make this purée up to 300ml (10fl.oz) with some of the reserved juice and test for sweetness, adding sugar to taste. In a small pan put 4 tbsp. of the juice, sprinkle on the gelatine and leave for a few minutes to swell, then over gentle heat allow it to melt but do not boil. Soften the cream cheese, mix in the fruit purée and melted gelatine. Whip the egg white until stiff, then in a separate bowl whip the cream to soft peaks. Fold three quarters of the cream into the blackberry mixture, followed by the whisked egg white. Pour onto the prepared base and put into the refrigerator to set (1-2 hours). When set, remove from the tin. Using the reserved cream pipe 8 rosettes around the top edge and 1 in the middle. Finish with the reserved blackberries.. Tip: the lining of the sides of the tin prevent discolouration. 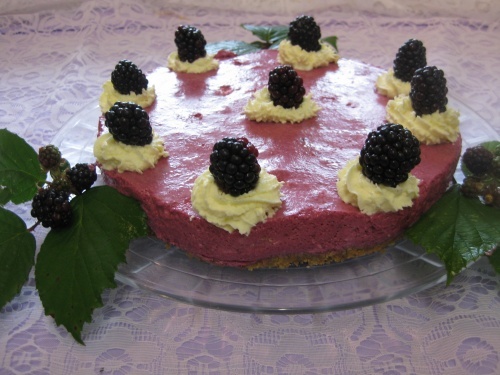 Frozen blackberries are suitable for this recipe.